It’s cold and wet in New York City. About this time of year I really start thinking about my summers in Colorado: the warm hay fields and night skies sugared with stars, the red rock smell of the Smith Fork canyon wafting through the cabin, the incessant buzzing combat of hummingbirds. 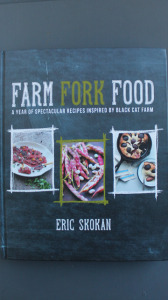 So you can imagine my delight when I read Farm Fork Food, a new book by one of Colorado’s organic family farmers, Eric Skokan. Black Cat Farm supplies meat and produce to their two Boulder restaurants, Bramble & Hare, and Black Cat Bistro, as well as a booth at the Boulder farmer’s market. 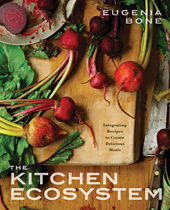 Flipping through the pages, I reveled in the pictures of farms with mountain views, the tiny Rocky Mountain chanterelles and marvelous high desert fruits, Colorado lamb and grass fed beef, and marveled at the diversity of recipes in this book. 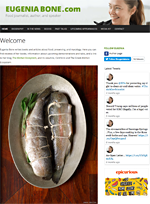 Are you into Italian, French, Japanese, Indian, Chinese, Thai, Mid-Eastern cuisine? Eric is, and judging from the range of these restauranty dishes (Beef Pot au Feau with Cauliflower and Watercress in a Ginger-Shrimp Broth, Red Lentil-Crusted Grouper with Saag), he’s a globalist with an eye toward regional possibilities. 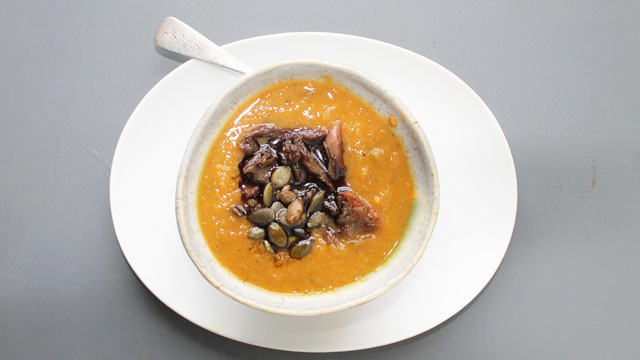 Among many terrific recipes, one example that’s a keeper for me is Pumpkin Soup with Duck Confit and Spiced Pepitas. The timing couldn’t have been better: I had a vat of confited chicken thighs in the fridge. I usually make eight or so thighs at a time, and then eat them in various ways over the course of a few weeks, but this was a new use of the product, and a really lovely one, too. The recipe calls for Japanese varieties of squash, but I had a butternut squash on hand, so I made a basic butternut squash soup, then took it to the next level a la Eric: garnished with shredded sautéed confit, toasted spiced pumpkin seeds, and a drizzle of pumpkin seed oil. The dish was so hearty and satisfying that despite the persistent chill of January, eating it made me feel warmer…a little like I was in the Colorado sun again. Toss the cubed squash in a large bowl with 2 tablespoons of olive oil. Season and place on a cookie tray. 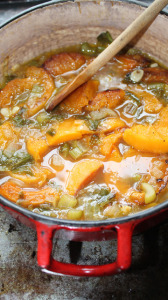 Place the squash in the oven and roast until tender when pierced with a fork, 30 to 40 minutes. If they caramelize (brown) a bit around the edges, this is good. Remove from oven. Heat the remaining 2 tablespoons of olive oil in a large Dutch oven over a medium heat.Add the onions and celery and cook until the onions are translucent, about 5 minutes. Add 1 teaspoon chili powder and stir to coat. Add the squash and stock. Bring the stock to a boil, and then lower the temperature to medium low. Cook for 10 minutes, allowing the flavors to meld. Puree the soup by using an immersion blender or by allowing the stock to cool enough to handle, then pureeing in a food processor a cup or two at a time. You can also press the soup through a food mill. If the soup seems too thick, add a little more warm chicken broth. Return the soup to the pot and keep it warm over a low heat while you prepare the garnishes. 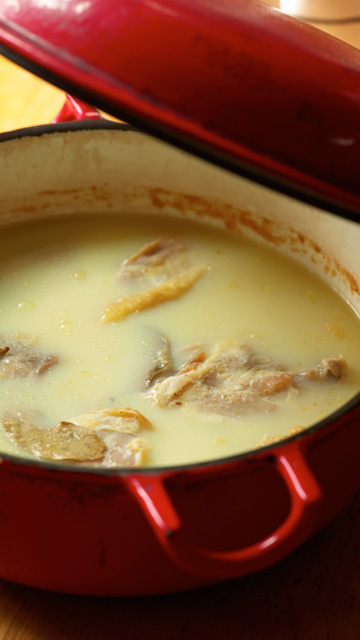 In a small sauté pan over a medium heat, warm the chicken (or duck) confit until crispy. Remove the meat from the pan, and then the meat from the bone. Shred the meat and set aside. In a small sauté pan over medium heat, toast the pepitas with 1 teaspoon chile powder and ground coriander until fragrant, less than a minute. Remove from heat. To serve, ladle the soup into bowls and garnish each bowl with shredded confit and spiced pepitas. Drizzle the coup with the pumpkin seed oil and serve immediately. Note: Pumpkin seed oil is very tasty and very dark. It looks like molasses on the soup. You can substitute with a good extra virgin olive oil if you like, or forfeit the oil altogether. Confit is a preservation method. But I don’t think the traditional confit recipes, where the meat is held covered with fat outdoors, makes sense for most people. I think the only place to keep confit and be sure your food is safe from spoilers is to hold it in the fridge. The brining stage of preparing a confit increases the holding time because the salt cure undermines the ability of microorganisms to grow, and the cooking stage kills or disrupts spoilers, too. More cooking, to crisp before eating, also kills spoilers. I prefer to eat my duck or chicken confit within a couple for weeks, although there are folks who believe it can hold a lot longer. The key is keeping the meat very cold and totally covered in duck fat and then heating it thoroughly before serving (to an internal temperature of 165°F). This meltingly tender dish is prepared the same way as duck confit (which utilizes the duck legs—just replace the chicken with 4 duck legs). You can hold the chicken thighs in the fridge, covered with duck fat, for up to two weeks. Combine the chicken thighs, salt, thyme, garlic, bay leaf, and peppercorns in a large zip lock baggie. Shake well to distribute seasoning and refrigerate 12 hours (overnight is best as there will be 4 hours of oven cooking coming up). Preheat the oven to 250˚F. Remove the chicken thighs and wipe off all the salt and herbs. Let the chicken rest for about 30 minutes in the refrigerator, wrapped in plastic, to allow the salt to distribute evenly throughout the flesh of the chicken. Melt 4 cups of duck fat in a medium sized heavy bottomed casserole with a fitted top over a medium heat. Tuck the thighs into the fat to cover. (You can add more flavoring at this point if you like: a few small peeled shallots or garlic cloves are good.) Place in the oven and cook for about 4 hours, until the chicken is meltingly tender. You can store the chicken in the refrigerator at this point. Bring the pot with the chicken to room temperature, then refrigerate. To use, remove a thigh, wipe off the fat, and heat in a skillet on top of the stove or in the oven until the fat is melted and the skin has crisped up. You can reuse the duck fat for another chicken confit project, but you will have some loss in volume. We made this tonight as a hopeful “farewell to winter” dinner, and it was delicious. Only thing is, toasting the pepitas dry meant that the powdered spices did not stick to them, so the chili powder just poured on separately on top of the soup. In absence of pumpkin seed oil, we tried a little walnut oil., which was subtle but went well with the other flavors. We had D’Artagnan confit de canard and crisped it in the broiler. Served a side of sauteed Swiss chard with raisins and balsamic. Probably putting the cooked Swiss chard on top of the soup would have been delicious, too! What else is usually in your fridge besides vats of confited chicken thighs?